Have you ever dreamed of being your own boss? Unleash your inner entrepreneur with heat press machines and sublimation equipment from the PixMax range at MonsterShop. 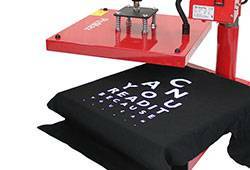 Our selection of premium sublimation t-shirt presses will create amazing unique garments, allowing hobbyists, professionals and budding t-shirt company owners to create amazing designs. Grab your computer, create some fabulous designs and print them out, plonk it in your heat press machine with a t-shirt, close the lid and ‘hey presto’ you have just created a unique masterpiece that could make you a millionaire. The well established PixMax heat press range at MonsterShop offers amazing value for money with awesome results. Grab a sublimation heat press machine today and it will whizz over to you as early as tomorrow if you order by 2pm.